TfL is consulting until 22 December on a scheme to benefit cyclists and pedestrians on Westminster Bridge and the Lambeth side of it. There is much that is promising, but the illustration and the plans show that the entrance and exit to National Cycle Network Route 4 remains across the pavement (where the people are standing above and below) behind the former County Hall. There is a simple way to reduce pedestrian / cyclist conflict at this point, which is to replace the barrier you can see with a retractable bollard so that cyclists can easily and conveniently enter and exit Belvedere Road rather than Belvedere Road (Obstructed) Pavement. The Toucan allowing access from the upstream side of Westminster Bridge Road should remain, but cyclists would move to the right to enter Belvedere Road, reducing interaction with pedestrians. Likewise cyclists emerging from Belvedere Road can cross on the Toucan parallel to pedestrians instead of co-mingled. Given that this is a Sustrans National Cycle Network Route, that there is minimal motor traffic on that private section of Belvedere Road, and that an original condition of planning consent is to provide a cycle route here, why is a simple improvement not being shown? The money is there - S106 funds were negotiated by Lambeth Council, consequent to responses from the public, to enable this as a requirement for Merlin Entertainment's receiving planning consent for Shrek's Adventure on the Shirayama owned former County Hall site. It is well known that the owners of this land are difficult to deal with regarding cycling. But if TfL with their new cycling scheme and budget; Lambeth Council with their S106 money and aspiration to be London's Most Cycle Friendly Borough; local politicians eager to reduce pedestrian / cyclists conflict at the crossing and local cycling and equality campaigners are all in favour of this easy solution then it must surely be possible, finally, to force quality cycling and pedestrian provision to be provided. When responding to the consultation, whether as a pedestrian or a cyclist, please demand that this cycle route junction be made first class off the pavement and along the lines I have proposed. 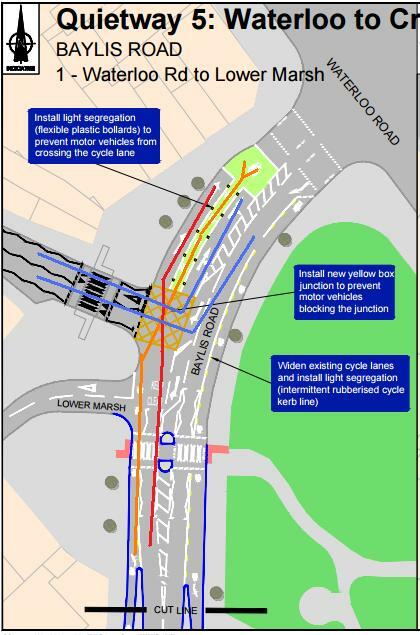 There is a consultation open until 21 December on the Baylis Rd / Waterloo Rd junction. Please read this blog and respond proposing what I suggest, or similar. My mother rang me from the top deck of a bus some twenty minutes after we'd left the theatre on Strand. I had cycled home but she was still on Strand, her bus stuck behind an endless sea of black cabs, many empty. 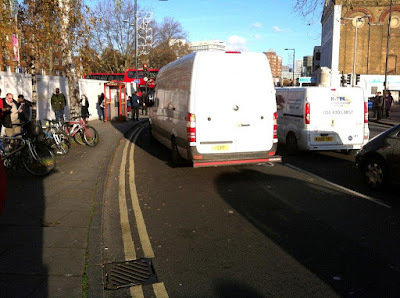 I was reminded of this yesterday when I attended an Urban Design London course that looked at the junction of Baylis Road and Waterloo Road and the difficulties of creating a satisfactory cycling Quietway on this designated route, a B road used by a considerable number of commuter cyclists, buses and taxis. From here the cyclists move across the Keep Clear area to the cycle lane you can just see between the two vans, to access the Advanced Stop Line at the traffic lights. The traffic lights may turn green as the cyclist approaches, which presents a challenge if s/he wishes to turn left. You can see why it needs to be upgraded to become a Quietway for 'Near Market' cyclists ( think taxi users who don't currently dare cycle in London and children going to secondary school who have undertaken on-road Bikeability cycle training in Year 6 primary). Yes, it's the same bar a minor detail or two as before. The 'near market' orange cyclist riding up the Quietway emerges from the left hand semi-segregated cycle lane and still crosses to the green lane in the middle as some red motor traffic (many buses) from the general traffic lane crosses, contra-wise, to the left hand lane. Blue taxis emerge from or enter the side road across the hatched yellow box. No-one felt this was a good scheme, but the engineers had failed to come up with something better. Last night I think I did, and I'd like you to propose this, or similar, in your consultation reply. Let's look at the context. The blue circle shows the junction and we are concerned primarily with the movement from the bottom left. The red lines shows the Quietways. The black lines show the principal taxi entrances and exits for Waterloo Station. 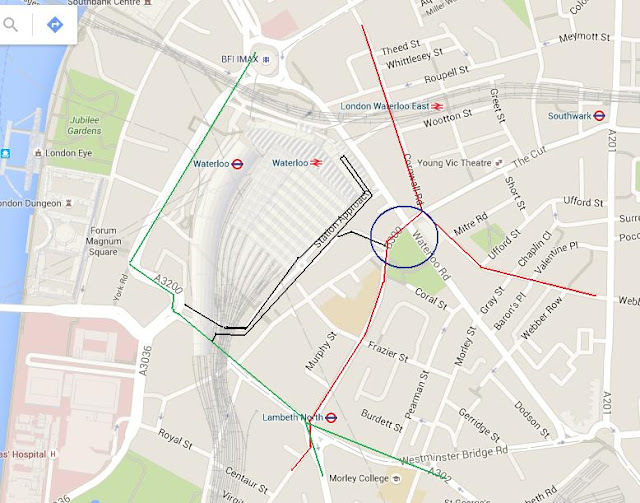 The Green line shows the A road approach from the Quietway towards the Imax roundabout, for Waterloo Bridge or continuing across towards Blackfriars. 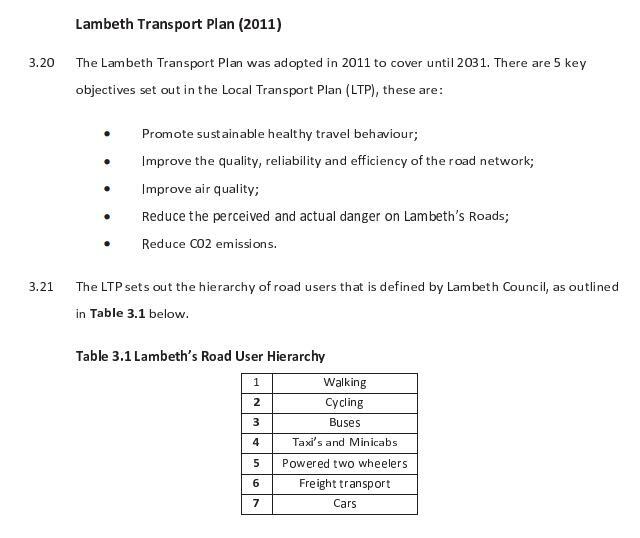 The first thing to note is that there is no need for general traffic making its way from Lambeth North to the Imax roundabout to use Baylis Road, a B road, and turn left at the end onto Waterloo Road. Any deliveries to that short stretch can be made by travelling up the Waterloo Road from Westminster Bridge Road or from the Imax roundabout. Secondly, taxis have a traffic light controlled entrance and corresponding exit onto the A road, away from the Quietway. Why ever should we provide taxis, a hugely inefficient form of mass people transit, with two entrances and exits to the station, to the detriment of bus, cycle and foot journeys? 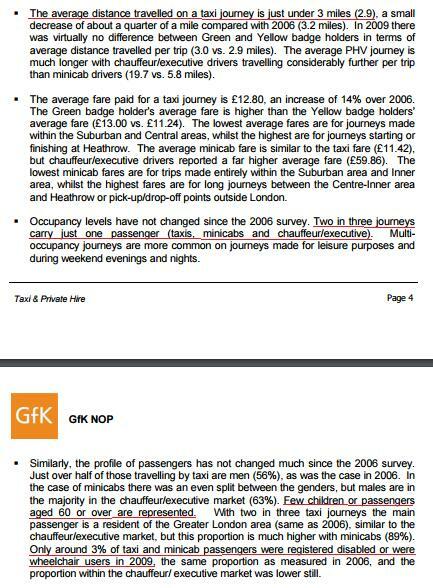 The overwhelming majority of people who take taxis could (my observation suggests) reasonably be expected and encouraged to use public transport, cycle or walk instead. People who need or wish to take taxis still have a perfectly adequate entrance and exit from the station. 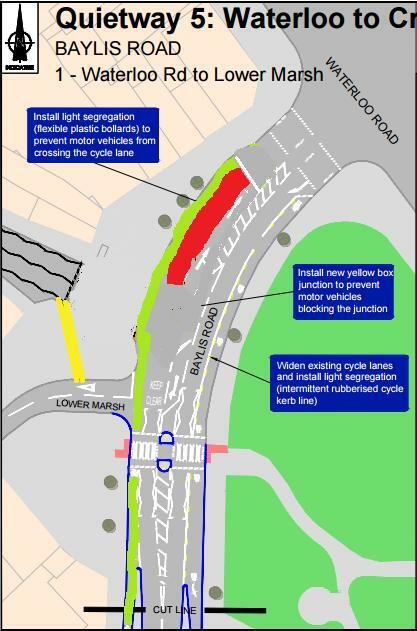 We now have a segregated cycle track, shown in green below, running to the junction (stop line moved back to wider road width section allowing space for a traffic light island). There is a bus-only left-turn lane, shown in red, and a straight-on general traffic lane to its right. Buses are released to turn left while cyclists and the general traffic lane are held at red. Buses don't get held back by taxis and other general traffic turning left into Waterloo Road or on Waterloo Road. At the same time traffic can turn right into Baylis Road from Waterloo Road. The bus lane light, and the corresponding light from Waterloo Road, then go red. Cyclists then get a green to go straight-ahead or left at the same time as the general traffic gets a green to go straight ahead. 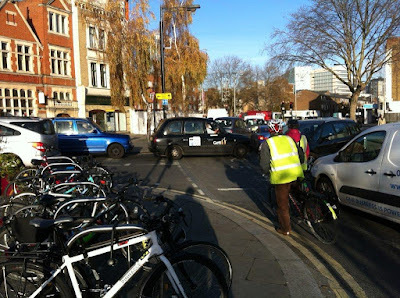 There is no turning conflict for cyclists with taxis for Waterloo, nor at the traffic lights, and they get their own time on Waterloo Road separate from buses. (A two stage right turn into Waterloo Road can also be accommodated). This is a child suitable 'near market cyclists' Quietway design. Cyclists can also have a Quietway link into and out of Waterloo via Lower Marsh (the yellow lines). There could be a larger cycle hire docking station here too. 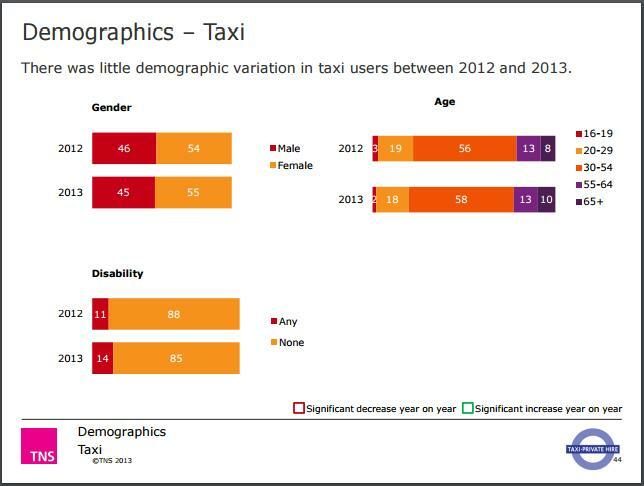 Buses, general traffic and cyclists aren't inconvenienced or put at risk by taxis turning into Waterloo Station. Pedestrians have improved public realm between Waterloo Road and Lower Marsh. Taxi users can still use Waterloo Station at the same cab rank. Some taxi journeys may be a tad longer to exit the station, but I think that's acceptable given their relative inefficiency as a mass form of transport. All premises remain accessible by motor vehicle. The scheme ticks the boxes. Please respond to the consultation NOW proposing an alternative along the lines I set out is provided. c) From the comments below, there appears to be a clear opportunity to avoid wasting drivers's time in the station through providing a drop off point or two outside. A super quick blogpost, as it's easier than trying to abbreviate to a Tweet! "Travel is good for the soul" is a phrase that rings true to me. I like getting out and about, having new experiences, seeing new things. We also know that people are generally content to commute for up to an hour in each direction (whether by foot, cycle, bus, car or train). I suspect that people are unhappy if they don't get some travelling done most days. How can our desire to travel, and maybe an innate need to get out and about, be squared with reducing our travel-related carbon footprint? 1. Separate 'travel' from 'delivery'. a) If I walk to a local charity shop and buy a pair of second-hand jeans there, I can cut out a motorised journey to a shopping centre, or a delivery van being driven to my home following my online purchase. The jeans are likely to have been delivered, maybe on foot, to the shop by a local resident from their home, rather than being transported from a manufacturing company overseas to a wholesaler to a retailer, then taken home by me. b) If some of the food I buy has been grown locally rather than abroad, I have reduced energy consumption on delivery. c) Ask your cafe to serve you your coffee in washable crockery rather than disposable, reducing in a small way the number of journeys delivering consumables to the cafe and delivering waste to recycling/landfill. 2. Think about what you want to see and why. Do you really benefit by going to New York as a Londoner? Might you get the same adventures being a tourist in your own backyard? Book a hotel near where you live, do some of the tourist things you haven't done locally, walking and cycling around lots, eat at restaurants you wouldn't normally eat in, join a tourist walk or ride. Look closer at where you live; maybe get into pavement geology! Might an hour wandering around identifying local trees nurture your soul as much as a trip to Kew Gardens? 3. I'm sure there are loads more things, but as I said this is a quick reply to a tweet. Feel free to add more in the comments section though!